A delicate and sweet-scented herald of summer, the Florida butterfly orchid is blooming now. A friend gave this particular orchid to me after it fell from her cypress tree, and every June it flowers prolifically, even though it now resides on a live oak tree. 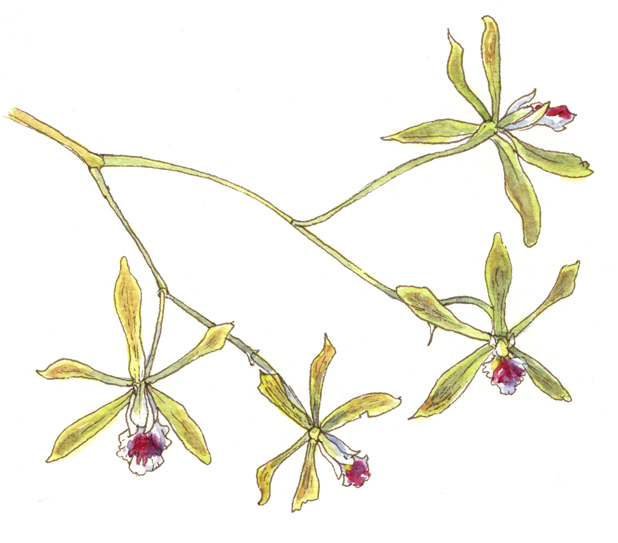 I took some time to draw it this weekend, both the blooms and the pseudobulbs. Although today is the first day of summer, it seems like it has been here in Southwest Florida for ages. Our temperatures have been in the middle to high nineties (Fahrenheit) every day, with very little rain (in our area) to cool us off. Despite the high heat, humidity, and scarce rain, green things are growing and thriving and blooming. I love this little orchid. The blooms are small but vibrantly colored and have a light sweet fragrance. The prominent white lip with its bright magenta-to-violet smudge serves as a landing platform for pollinators. Although butterflies will visit the flowers, pollination is mainly performed by bees. It’s speculated that the common name comes from the similarity of the dancing flowers on their long stems to as cloud of small butterflies fluttering in the tree branches. I sketched the orchid bulbs and leaves on site with my sepia Micron Pigma pen and added watercolor later, in the comfort of a mosquito-free environment! If you look at the spent flowers, you can see the swelling seed capsules forming. I sketched and painted the flower studies inside, so I could take a little longer and look at the flower structures from different angles. The Florida butterfly orchid is one of our most common orchids. It grows on tree branches as an epiphyte, gathering its nutrients and moisture from the air. They’ve become more rare as people have collected them and their natural habitat of cypress and slash pine trees have fallen to development. 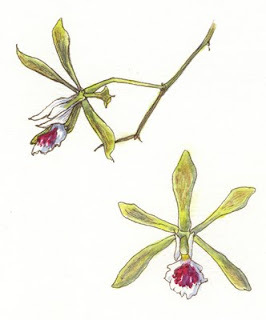 Native orchids are now protected by law, and should never be collected from the wild. 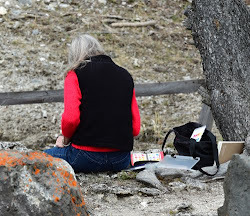 If you’d like to see my drawings and blog entry from last year (6-28-10), please click here. 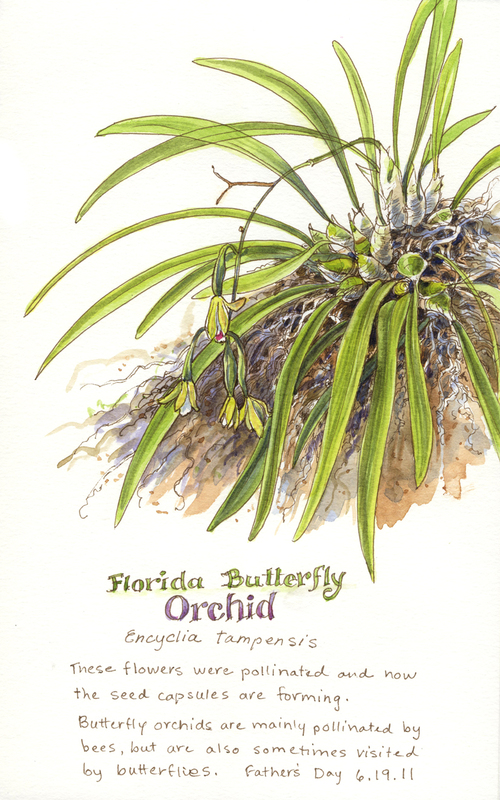 Click here for a free PDF file of a Florida butterfly orchid that you can save and print. And you can always visit my Flickr photostream to see all of my nature journal images. Amazing how well they do in spite of the weather! Thank you Linda! I appreciate your kind words. Hi Kathy - I had an orchid like that once, and finally it bloomed. I never knew why. I feel so fortunate with this one that it's still thriving! Hi Jeanette - it always surprises me that our green things can be so vibrant in the period right before our rainy season when it's HOT and humid but the ground is very dry for lack of rain. We humans are the ones wilting! Oh my god I'm so happy to find out your journal! I'm a student of biology and i'm starting to practice and improve my sketching abilities. I agree with you, I really think that drawing the nature around us can improve pretty much our observation and learning. 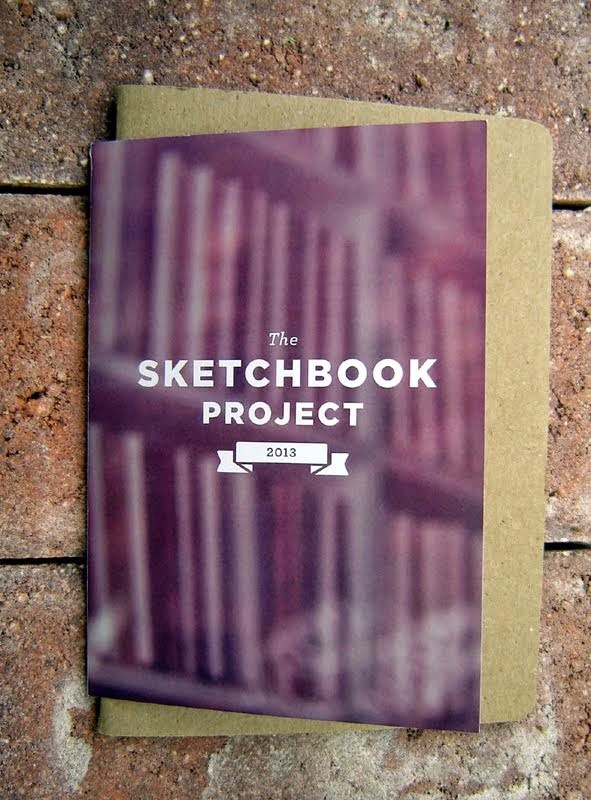 I will use you and your work as one of my inspirations. Your work is marvelous!! Hello Roberta, and thank you so much! As a student of biology (and art) you'll find that you will connect to your subject more when you draw. I always learn so much, especially when my observations lead to questions, which then lead me to finding the answers! I'm so glad to be an inspiration, especially as so many have inspired me along the way.Your kind words wil help me to have a happy week! Oh my, I'm sure an orchid like this would not flourish in my climate, but you've inspired me to get myself a new one of some sort! I have to grow them indoors, but I do love them! Love your work, as always!!! Thanks so much Elva and Mary! I find orchids fascinating(especially the native ones) and I know how attached one can get to them. Thanks for your kind thoughts! Thanks, Pam! What nice words to make my day! What beautiful sketches of Florida Orchids. I didn't know they had a scent to them. I bet butterflies like this plant as well No? Thanks so much! They are pollinated by bees as far as I know. I've never seen butterflies attracted to this orchid, but the delicate blooms do indeed flutter in the breezes like tiny butterflies!